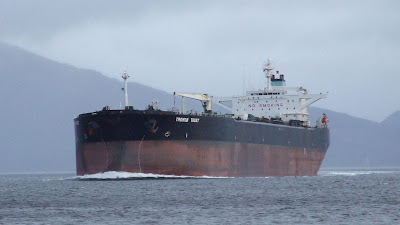 Sailing from Finnart early this morning was TROMSØ TRUST, a Liberian-flagged Suezmax tanker of some 154,790 tonnes deadweight. Built in 1991 in Korea by Hyundai Shipbuilding and Heavy Industries at their Ulsan shipyard, she had arrived earlier in the week with a cargo of crude oil. Her next port will be Covenas in Colombia. Her length is 274 metres, her breadth 43.93 metres and her draft when fully laden is 17.5 metres. She is driven by a six-cylinder Burmeister & Wain engine. She recently changed hands together with a sister ship for US$ 96 million, and it appears that her current owners are actually based in Indonesia. An image which gives a great impression of size and power! The ability to walk on water is obviously something one develops from a very early age!! Still drying out from Haylie Brae! !